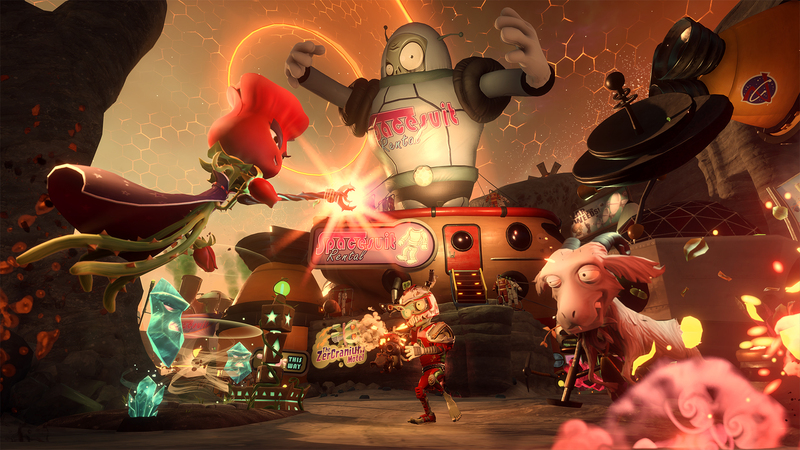 Garden Warfare 2 is everything a sequel should be…filled with more content & improvements across the board while retaining the core gameplay that made the first so endearing. The very first thing you’ll notice when loading up the game is the improved visuals. 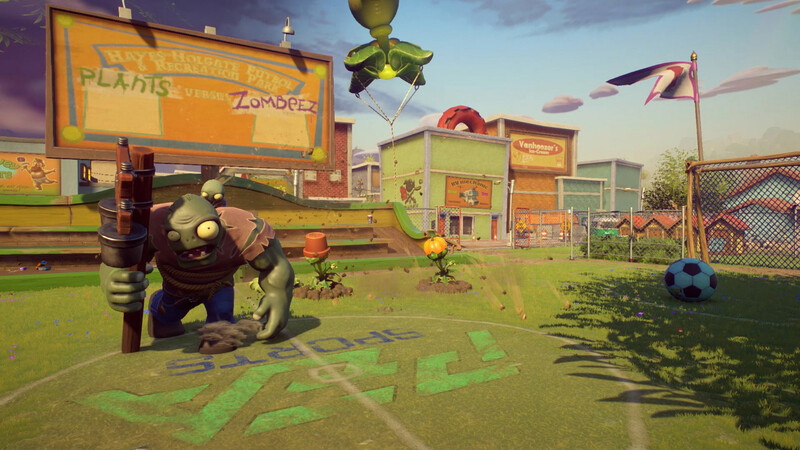 Plants vs Zombies: Garden Warfare 2 is gorgeous, brightly coloured & with detailed environments that just make you want to explore even more. 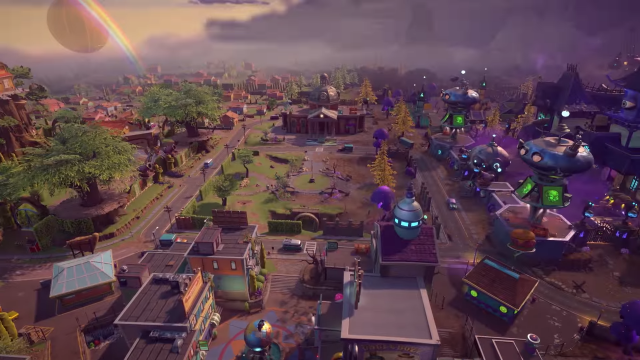 You see one of the major changes in this sequel is the introduction of the hub/battlefield. 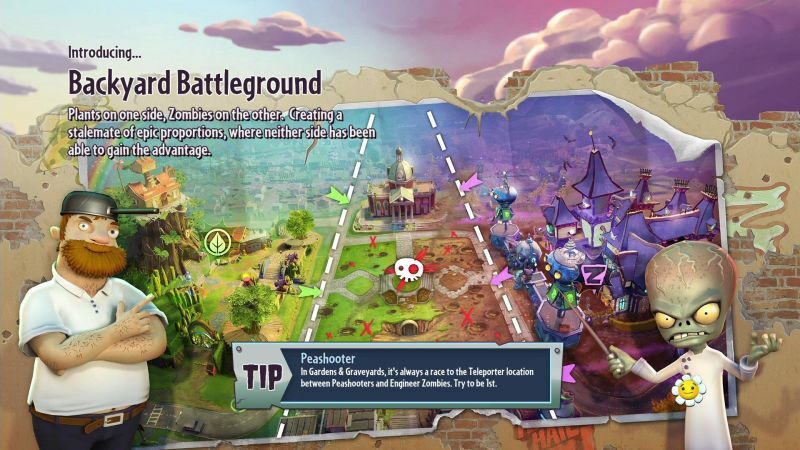 The war between the plants & zombies has reached epic proportions & they have effectively beaten the other into a stalemate with both sides controlling one half of a large fully-able to explore town. On one side we have the plants, the other the zombies & in the middle a kind of ‘no man’s land’ where battles constantly rage. You can switch between the sides whenever you choose meaning you get to experience both sides of the war. Any thoughts that the hub area serves as little more than a stat/multi-player starting point is quickly dismissed by a little exploration. It is packed with things to do & is one of the most impressive improvements of the entire game. It is also where you start the single player side of the game…yes, you heard that right. 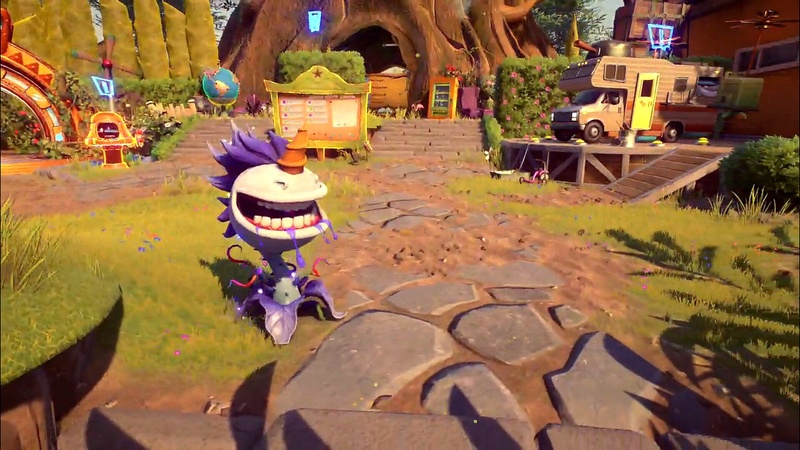 Plants vs Zombies 2: Garden Warfare 2 has single player content! It is a sad state of affairs when a game has praise thrown at it because it decided to include a single player story mode. So many games focus only on the multi-player aspect of their game now (Star Wars: Battlefront) so it is refreshing to see a game offer not just a single player story but one that is fun. 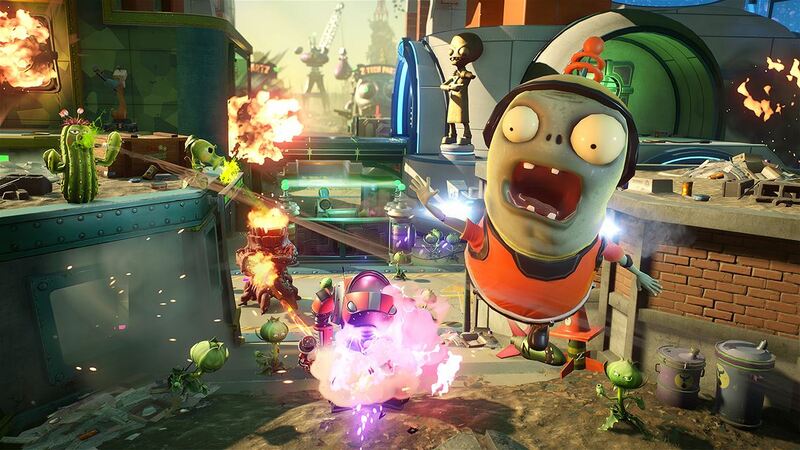 That this comes with a sequel no less is even more surprising (PvZ: Garden Warfare did not have a single player story). 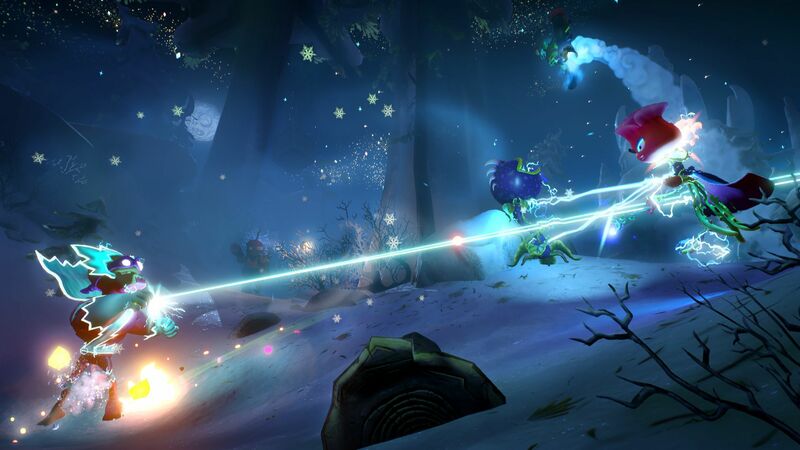 One of the biggest changes in Garden Warfare 2 is that everything the plants can play so can the zombies! Garden Ops returns in a similar vein but with more maps to choose from, 1 to 4 players work together to defeat waves of the opposite team. With more variety in maps & enemy types this mode is a lot more fun than it was originally. The bulk of the game is of course taken up with the multiplayer options. Going online you can find a number of game modes to play. The Welcome Mat is effectively a good place to get used to the game & variants/customisations aren’t useable here. 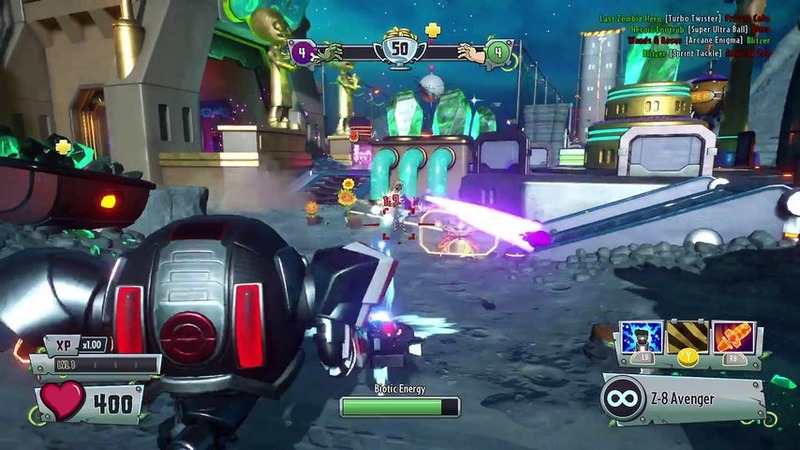 Team Vanquish is PvZ: Garden Warfare 2’s Team Deathmatch while Turf Takeover is Gardens & Graveyards from the first game with both teams taking turns at attacking & defending. Easily the most populated & most fun mode to play with lengthy matches & plenty of action to enjoy. Gnome Bomb sees the teams fighting over control of the bomb to plant it at the other team’s garden or graveyard. Vanquish Confirmed is similar to Team Vanquish except everyone drops orbs when they die. Pick up an enemy orb to score while also trying to pick up your teams dropped orbs to stop the others from scoring. Suburbination is capture the rings & hold them to increase your score style of game while Mixed Mode is exactly what it suggests, a mix of all modes. As you can see there is plenty of modes to play here & with such a large variety of characters to choose from you won’t be getting bored anytime soon. 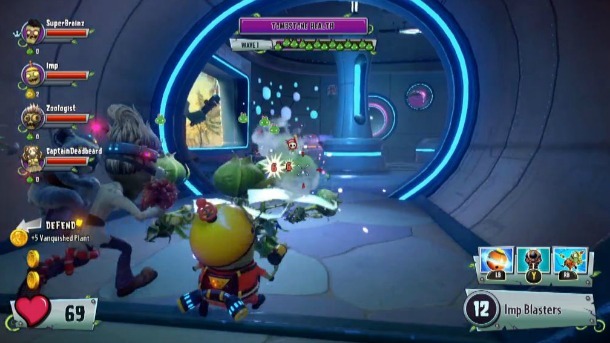 Firstly, the characters from the first game make a return (Plants: Cactus, Sunflower, Chomper & Peashooter – Zombies: All-star, Scientist, Engineer & Foot Soldier). Each have their own very useful abilities & in a surprising move all your variants earned in the first game can be brought over! In fact, your level earned in the first game will see you rewarded with coin bonuses. This is brilliant, it wasn’t something they had to include but it rewards long-time players. If you’re a returning player, chances are you’re going to be drawn towards the new characters. The zombies have Captain Deadbeard, Super Brainz & Imp, 3 very different style of characters & all with both good & bad points. 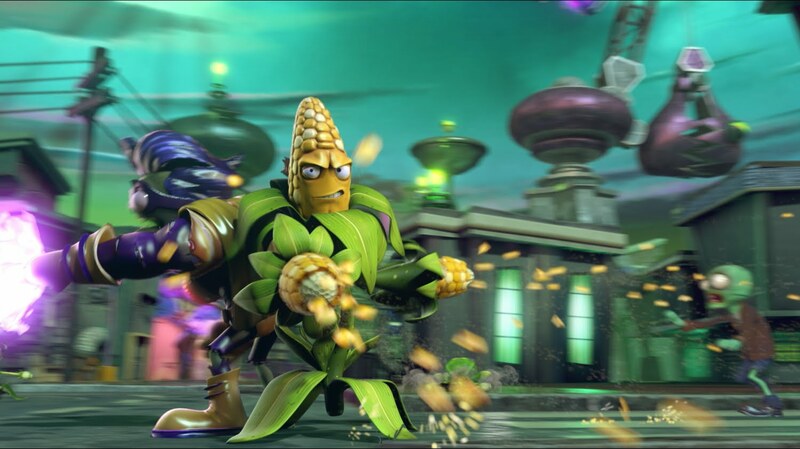 The plants get Kernel Corn, Citron & Rose with the latter being my only complaint about the game. Rose’s main attack is a homing attack that fires very rapidly, the drawback is that it is slow to reload & doesn’t do lots of damage. However, it makes the character very easy to use as she is light & quite fast. 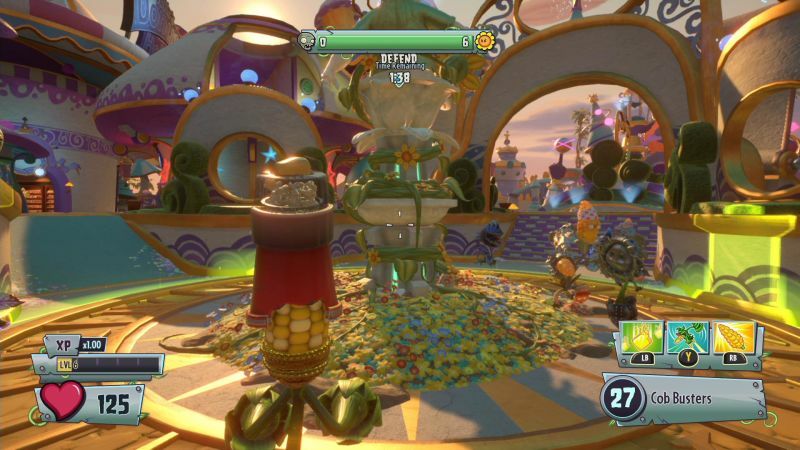 Far too many game modes start with most of the plants team playing as the rose or one of her variants. It’s very frustrating as the game actively encourages you to try the different characters out! Each can be levelled up but unlike the first game these are no longer tied into your overall level. The characters can reach level 10 & get promoted with a new title then start from level 1 again. You can do this 5 times with all earned abilities & costumes coming along each time. There is a huge amount of customisation available to not just the characters but the hub & surrounding town too. Character customisation comes from opening card packs & by earning them doing certain quests. Hub & Town customisation starts with earned stars…. these are gained by completing optional quests during gameplay. In each hub there is a quest board where you can select a number of quests to partake in. These range from vanquishing 15 roses as zombies or completing 25 games of Vanquish Confirmed. Each completed one will give you stars as well as a red pin that charts your progress along an XP multiplier. Players can earn up to 2x extra XP & that this isn’t stuck behind some sort of in-app purchase paywall is a surprise, a very welcome surprise. The sticker shop returns but this time the game is far more generous with the coins earned by doing quests & playing the multiplayer. You’ll be opening packs every game or so depending upon what ones you want. It’s makes it a game in itself as you collect parts to create even more variants on the characters you have already.